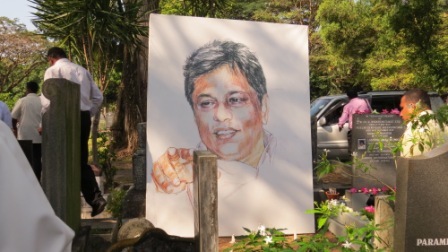 In a strange twist to the Lasantha Wickrematunge murder, a retired Army Officer today committed suicide while claiming to have killed the slain editor in a suicide note he had left in his house in Kegalle. In the letter, the retired army officer has requested authorities to release Army Intelligence officer Premananda Udalagama from remand as he had nothing to do with the assassination of Wickrematunge. However, CID sources told Colombo Telegraph that the Army Officer who committed suicide, retired in 2007 and Wickrematunge was assassinated in 2009. The retired Army Officer who committed suicide is a 51 year old man and a father of three. His body has been sent to the Kegalle General Hospital for a postmortem. Kegalle Police are currently conducting investigations. Brave Army officer lost to the nation because of traitor Lasantha. We salute u on behalf of patriots. Lasntha now in the hell with his master praba. Brave men Army or otherwise face real life situations its cowards that commit suicide. Can you use the word BRAVE here ? It was an another contract to cover up the former. This demonstrates the vicious and irrational minds of some chime . Did he get promotion and salary paid after killing like sergeant on remand identified by witnesses? Another bungled attempt by the filth like beating up supporting editor and his wife? For whom did he do this? Was it with ulterior motives? Why did he do this? For whom was he covering up? Was he in the know of too many facts that would implicate his former bosses, which he did not want to divulge for love or for fear? This must not be taken at face value, there must be a thorough investigation into the background of this Officer and the one he is trying to exonerate, now that there is another lead to the investigation. This individual is NOT an ARMY OFFICER. ARMY OFFICERS are those in the rank of Second Lieutenant and above. To be designated an Army Officer one should have a COMMISSION from the Head of State of the country. The Army is segregated into two major sections, they are, OFFICERS and OTHER RANKS. Among the Other Ranks there are the SOLDIERS and the NON COMMISSIONED OFFICERS. Non Commissioned Officers are those with a “STRIPE” on their upper arms, ie: Lance Corporal and above, but below the rank of a Second Lieutenant. Army Officers are initially enlisted into the Army as Cadet Officers and after about an year and half of basic training they are COMMISSIONED in the rank of Second Lieutenants at a passing out parade and given a “PIP” to wear on their epaulettes. Until a Cadet Officer receives a Commission he too is considered an Other Rank, but Other Ranks do not salute them and addresses them as Mister with their surnames when spoken to. An Army Officer was an exalted position in society during the days of yore, but with a war raging the Government had to recruit persons sometimes overlooking some basic requirements like their family backgrounds etc, hence we have many black sheep today in the Army who have brought down the respect of this profession to abysmal depths. This sad situation is not only confined to our Army but to corrupt politicians, inefficient bureaucrats and the general populace too. It is sad but the quality of an average Sri Lankan citizen has fallen to very deep depths, with Doctors, Principals, teachers,students etc etc taking up cudgels with authority at the drop of a penny and blocking roads and destroying public property on a daily basis. Something is radically wrong with our society which a few decades ago was respected the World over. I believe it is our screwed up education system that is responsible for this debacle, and until we pull up our socks and do what is right for us, which pill would be bitter for some, our generations to come would find it an uphill task to get the better off this world we live in. So now are war heroes being killed to protect war criminals!? So Rajapaksas are killing all those involved in their crimes and framing some!? The remaining lot will have no other option but to come out with the truth implicating all the Rajapaksas before they kill them.